I don’t even know where to begin with this review, but I think I’ll start with telling you a bit about the company and owner of this gorgeous website called, Sanari. Lately, I’ve been exclusively centering on reviewing companies I personally feel a calling to and I must say, I was completely drawn in when I entered Sanari’s website to look around. Were their candles calling to me? Oh my goodness, yes! I found myself devouring their story and descriptions of all the fragrances they meticulously created. Visually, their website has a luxury vibe with the layout very simple, soothing and well presented. Their story is listed on their home page explaining their plant based, eco-friendly and organic philosophy. What does than mean exactly? It means they only use plant based, organic and raw materials with pure essential oils to manufacture and fragrance their candles. So, if you live an organic lifestyle or simply love to pamper yourself with a bit of luxury… Sanari is a perfect company to try. Rebecca Aghalarpour is the owner of Sanari (pictured to the right) and her story began with a candle and a cup of steaming tea as she baked every Sunday afternoon with her daughter. 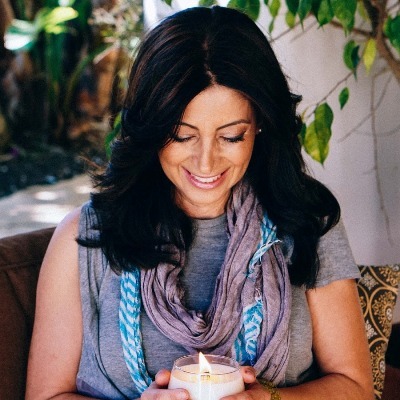 Candles were a huge part of her daily life until she developed breast cancer, forcing her to eliminate products in her home that she found to be toxic to her health. Much later and missing the glow of a candle, Rebecca began her journey into the world of organic candle making and Sanari was born. You can read her full story here as well as more info on her company if you’re interested. It’s all very fascinating. Now… onto the candle I received. When my package arrived, a beautiful and thick decorative box was covered in custom Sanari tissue paper. The box itself, a dark gray and custom fit to house the beautiful candle securely nestled inside. The best part, the box is made with recycled paper and printed on all sides with soy ink. Now that’s organic detail! The candle itself… each candle is hand poured in a recycle stem-less wine glass, so you can repurpose it as a drinking or wine glass when you’re finished burning the candle. Even the wicks they use are unique. Their wicks are 100% organic unbleached cotton and wide (3 tiers) for an even burn and specifically designed to use with their organic coconut wax. The detail that’s been put into these candles tells me so much about Rebecca and her company. It indicates they truly do adhere to their environment friendly philosophy. The candle! – – I chose the fragrance Granita to review. The ingredients literally called to me. Herbal and citrus notes of wild rosemary, with juicy pink grapefruit, falling into heavenly bergamot and luscious sweet tangerine, finishing it off with dry and mild oak. Now that’s quite the scent description with a lot of complexity going on. Rosemary is what called to me the most. It’s such a fresh and happy herb and I knew blended with the citrus notes would make for one heck of a fragrance. Smelling the wax, I could tell right away this candle was fragranced with essential oils – the characteristics are unmistakable. Cold sniff, the aroma was light, but the true test is once the wick was lit. That’s when the true magic begins. And that magic starts right now. I decided to stay conservative and light this candle in a small room to start out and that’s where it remained till the very end. Once the wick was lit, I found myself watching it burn with curiosity for a minute. This wick intrigued me. It was wide like a wooden wick, but Sanari’s was made of cotton and was thin like paper. I had never seen a wick quite like this one before and I must say, it burned and danced beautifully once lit. The candle achieved a full melt pool within no time at all and the aroma… a beautiful aromatherapy fragrance filled my bathroom. All the essential oils listed in the description were blended so beautifully, I was having a hard time pinpointing any specific one but if I had to choose, I would say I smelled the citrus/tangerine with hints of rosemary and mild oak the most. To me, this candle smelled like pure aromatherapy. It was soothing and refreshing… the kind of aroma you want to breathe in with a smile. You could tell this candle was made with all-natural ingredients and it’s something I recommend you experience firsthand to really understand what I mean. Strength – because this candle is fragranced with pure essential oils, I knew it was going to be light. When you know that going in and find the right room to burn it in, it’s perfection. In this case, a small room worked best and oh my goodness was the fragrance amazing. On a scale of 1 to 10, I would rate this candle an 8 in a very small room. 4/5 in a medium size room. How did my Granita candle burn? What a wonderful experience this turned out to be. I don’t burn aromatherapy candles that often anymore and I don’t know why. Candles fragranced with pure essential oils do hold a special place with me and it makes me realize I need to burn them more often. Why not? Don’t we all deserve to be pampered with the very best? 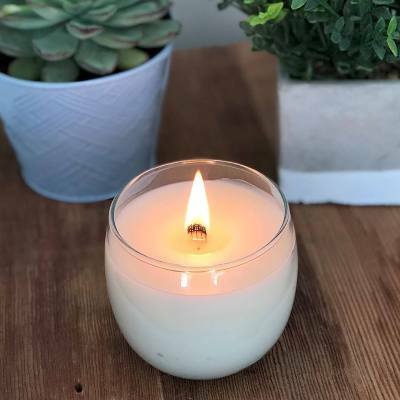 So, if you love organic candles made with pure essential oils down to the finest detail… the wick, the recyclable vessel and packaging, the all organic wax… this is the company to try. Candles made with pure essential oils do tend to be lightly scented so if you’re after fragrance, burn them in a smaller room like I did. If however you’re just after a fresh and healthy candle, these beauties are perfect to burn in any size room for a subtle aroma or ambiance. I’m definitely impressed and will be trying and reviewing another candle very soon. 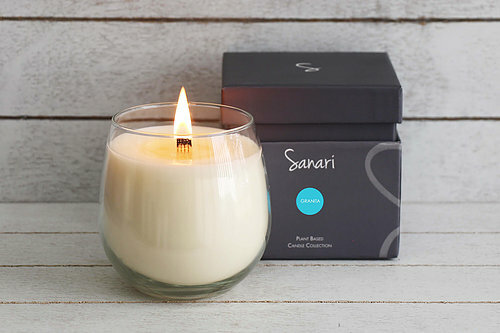 Granita is one of my two favorite Sanari Candles, so far. The other is Aria. I still need to try the Bosco, Trentino, Pompelmo, Fresco and Biscotti. I have started sending them to my friends and family as gifts – they are lovely.